These are the heels for women who are confident in their sense of style. They are made of red colored material. The toe box has an almond pointed design. The heel back is very tall with a cuff design the top. 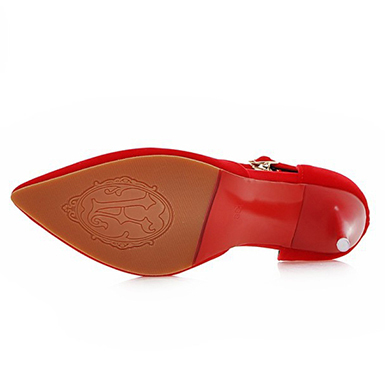 The heel back has a curved and sleek design. 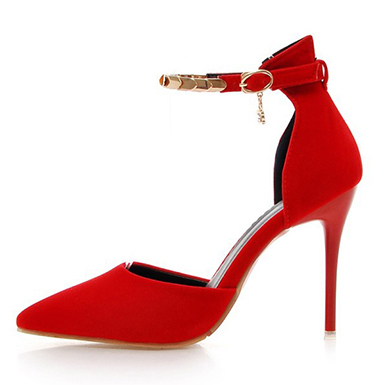 An ankle strap has been added to the top if the heel back. The heel strap has a gold buckle added to it. A small chain and gem charm has been added to the buckle. A gold metal strap accent has been placed on the front of the ankle strap. The heels are tall pin style stilettos.